Gospel singer Weezdom has patched things up with his friend and mentor Bahati two years after falling out. He was even invited to the relaunch of EMB records and had nothing but heaps of praise for Bahati. “It’s been an amazing journey in my music ministry and today I honour the person who God used to make a way for me when I had no idea where to start. Brothers fight, brothers have misunderstandings but that doesn’t change the fact that they are brothers. I wish you all the best bro @bahatikenya and your wife @dianamarua and congratulations on the #EMBRebirth yesterday. Injili isonge mbele,” Weezdom wrote. The ‘brothers’ have officially fixed things 2 years after they fell out. 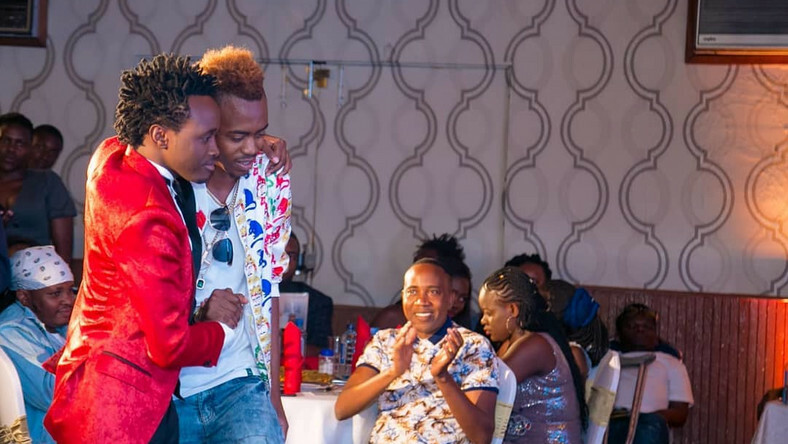 Weezdom indicated that they were not in very good terms after claiming that Bahati had furiously pulled down his music video from YouTube after spotting him in his rival’s Willy Paul music video. 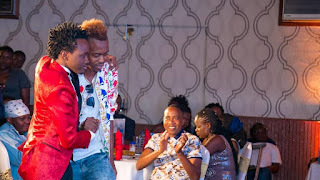 “I am friends with everyone in the industry… That is what Bahati taught me – that I should be friends with everyone including Willy Paul @willy.paul.msafi. I don’t know about their rivalry but I know that the Bible says we should love one another. Me and Pozze have been friends for a while and Pozze was doing a music video a few days ago and he called me to be his best man since now am a #betterman and when I posted about Willy Paul a few hours later, since my music videos were on Emb/Bahati’s channels, I woke up and found that Bahati had apparently deleted my songs… I am not bitter am just shocked! That he would stoop so low, but since he taught me the art of forgiving, I will let it go coz my wealth is not on earth but in heaven… I forgive Bahati as my big brother and my mentor and I know that in heaven we shall not be judged by YouTube views and comments…‘Amenitoa Far’ was just a video and these are material things… I forgive you Bahati… now that you have taken the landmark of our respect it is very sad but I am a better man,” Weezdom wrote. At that point, Weezdom had not revealed why he left EMB records in 2017, but in a candid interview with Mseto East Africa, Weezdom said that he left becausethings changed when Diana came into the picture. He gave details of how things changed from the plans they had working together to how they related as friends and he had to walk out of EMB. Weezdom went on to say that Diana Marua made sure he left Bahati’s life but refused to divulge further into what happened or how she made sure he left. “Sikuwa na option ilifika mwisho ikakuwa lazima niende. Naweza sema nilishindwa kuendelea na kazi kwa sababu kuna mabadiliko ambayo yalikuja mwishowe na unajuamimi naheshimu sana Bahati kwa sababu yeye ndiye alinipata nikiwa down pale mtaani akaniinua. Akanichukua kama kakake tumeishi nyumba moja kama miaka tatu. Lakini kuna mabadiliko yalitokea baadae nikafeel siwezi endelea. Naweza sema ni mtu ambaye anaitwa Diana Marua, yeye alihakikisha nimetoka. Sitaelezea Zaidi sababu nilimsamehea Bahati maanake Diana simjui sana. Alifanya kakangu akabadilika kunihusu kikazi, kuishi, kiurafiki nikawa na mazingira magumu na nilikuwa msanii ambaye ninaanza kwa hivo nikaona badala ya kuleta mavurugano nikaona niende nje nijitume mungu afungue njia kama wengine,” said Weezdom.